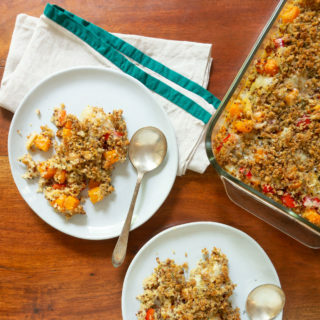 With a crispy top, this Butternut Squash Gratin is packed with quinoa, red pepper, squash and gruyere. It makes a great vegetarian side dish or main dish. Perfect for the holidays and easily made ahead of time! Rinse quinoa under cold water. Combine quinoa with 2 cups of water/broth and 1/2 teaspoon kosher salt. Bring to a boil over high heat. Reduce heat to low, cover, and let cook for 25 minutes or until liquid is absorbed. In a medium bowl, toss together butternut squash, diced red pepper, diced onion, quartered garlic cloves and 2 tablespoon of oil. Season to taste with salt and pepper. Arrange in a single layer on the prepared baking sheet. Bake for 20 minutes, onions should be starting to brown. When the vegetables are roasted, mix them in a bowl with the cooked quinoa. Taste mixture for seasoning, add salt if needed. Transfer the quinoa/veggie mixture to a lightly greased 9 x 13 baking dish. Combine milk, half the cheese, thyme, 1/2 tsp salt, black pepper and cayenne pepper. Pour over the quinoa. Stirring gently to incorporate. Top dish with remaining cheese. In a small bowl, combine the breadcrumbs, the remaining 2 tablespoons of olive oil, the remaining herbs, and the remaining 1/2 teaspoon salt. Toss with your fingers until the breadcrumbs are covered with oil and seasonings. Sprinkle evenly on top of the cheese and then with a couple pinches of Kosher salt. Bake uncovered at 400°F. for 20-25 minutes until top is golden brown. Turn the oven temp up to 425 for the last 10 minutes if the top isn't browning yet.